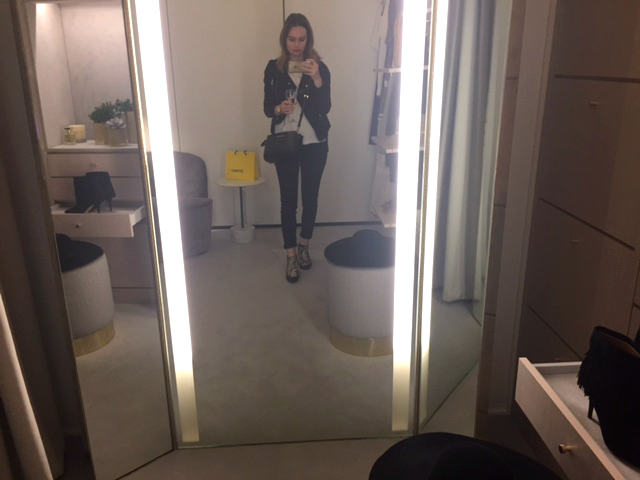 A few weeks ago I was invited to Selfridges in Manchester to a Personal Shopping appointment on their brand new designer womenswear floor. I was pretty excited as I do like to spend my lunch hour wandering around wanting all of the pretty things. Now, let me tell you. This resigned space is something else, I think I took about 100 photos just because everything looked so perfect! From Céline, Balenciaga and one of my favourites Self Portrait. I was shown around the Personal Shopping area (which is an interior lovers DREAM) and talked through some of the best sellers and key pieces for AW. I think my favourite thing about the whole experience was the relvalation of Charlotte, Selfridge's beauty Personal Shopper. It has never crossed my mind that this isn't really available in other department stores, as each counter has their own staff. Charlotte will give you an unbiased shopping experience with regards to which brands and make sure you get what suits you and your skin. You need to get following her Instagram (@selfridges_beauty) as there's loads of previews, swatches and alerts to back in stock! Perfection. This sounds (and looks) like a dream. Maybe one day! After purchasing this deal, you will need to visit the website listed on your Groupon voucher to complete redemption. See voucher for more information https://viennaimports.com/vampire-blood-incense-sticks-nandita. Personal shopper can help you in choosing cloth or something else. They will always help in in this problem. So keep faith in them and hire a personal shopper. The best work at home employments were elusive or they required abilities that I simply did not have. Buy China Products in Dubai Thanks for sharing, this is a fantastic post. Really Cool. They some way or another appeared to have aced the specialty Jennifer Aniston Skin Care of setting aside some cash when shopping.